My deer-hunting seeds were planted and nurtured as a youngster on my family's small farm in central Minnesota, where I nervously waited for November whitetails to step in front of my quivering slug gun. Back at the farmhouse, mounted racks from white-tailed bucks adorned the dining room walls. My great uncle had claimed the Midwestern bone trophies over decades as a deer hunter, but I was even more captivated by the forked antlers on the wall that came from a different type of deer. I would prod my hero for stories about these mysterious mule deer, and for years I dreamed of tagging a muley of my own. Finally, my first opportunity came to chase the iconic deer of the West. My adventure took place in the Sandhills of Nebraska, and after long days of spotting and stalking in subzero temperatures, I was blessed to kill a mature muley buck. Now he will find a place on my wall — not just for my own pleasure, but to inspire others to chase the handsome beasts across the great wide open. Mule deer are a struggling North American big-game species. Great organizations such as the Mule Deer Foundation (MDF) and the National Deer Alliance continue to address the issues that impact the dwindling future of mule deer, but they can't do it without widespread public support. That means you. Before you prepare to squeeze a trigger, consider dropping a shilling in the hat for muleys, or at least show up when it's time to cast a ballot or raise your hand when decisions are being made that impact the species. If you're ready to travel out of state to hunt muleys, read on. I met with the hunt-planning gurus from Cabela's T.A.G.S. to identify six of the top states for nonresident mule deer hunters. I also chatted with several other experts to collect useful details that should help you plan your next hunt. Each state has something unique to offer, so pay attention. Arizona continually makes headlines with giant muley bucks harvested in the Arizona Strip and the Kaibab Plateau. Trouble is, drawing a tag in these coveted areas ranges from extremely difficult to almost impossible. But if you're willing to do your homework and patiently accumulate bonus points, you could find yourself hunting some of the biggest bucks in the country. "Since 2012, nobody has drawn a mule deer tag in the Arizona Strip [units 13A and 13B] with less than 15 points," explained Eric Pawlak, manager of Cabela's T.A.G.S. "You do have a chance of drawing a tag to hunt the Kaibab [units 12A and 12B] — especially if you're a bowhunter. "In 2014, 550 archery tags were distributed for this area, with a season that runs from late August to mid-September. The odds of drawing with zero points were 25 percent for 2014, and with just three points you were guaranteed to draw. "Draw odds are also fair for hunters who apply for the early rifle season [Oct. 23-Nov. 1 approx. ], but I'll warn you: Early hunts on the Kaibab are extremely tough because of high hunting pressure and lack of rut activity. The late rifle season is generally when most big deer are killed, but again, you typically need a lot of points to draw a tag." 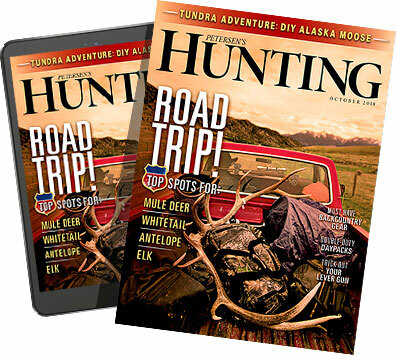 Pawlak also warned that while it's easier to get a muley tag in units south of the Grand Canyon, you shouldn't expect to encounter the class of Arizona bucks that have caught your attention on magazine covers. Miles Moretti, president of the Mule Deer Foundation, also showed optimism for Kaibab hunters. "After all the rain last year and more rain this year, things are looking good," he said, pointing to the significant influence that moisture has on deer health and antler growth. "I'm expecting some nice bucks to be killed there this year." Despite its reputation for liberal politics and tie-dyed hippies, you'll still find a healthy population of camo-clad deer hunters when fall arrives in the Centennial State. The Colorado Parks and Wildlife has seemingly achieved the perfect balance with its deer management strategy — accessible tags and potential to kill noteworthy bucks. "I think the number one mule deer state for people to be building points in is Colorado," Pawlak said. "There are big deer from the eastern plains to the western slope, with a mixture of private and public hunting land. In the eastern plains, it typically only takes five or six points to draw a rifle tag and zero to three points to draw an archery tag, so you can find yourself hunting big mule deer in a relatively short amount of time." Because of the widespread distribution of Colorado's deer herd and tags to match, hunters are somewhat relieved from the disease known as "point creep" that often hinders the prospects of planning a solid muley buck hunt. "We carefully regulate harvest, hence the quality of deer hunting right now" explained Colorado Big-Game Manager Andy Holland. "Ninety-seven percent of deer licenses can be drawn with zero to three points. The statewide average for buck-to-doe ratios is 35 bucks per 100 does — that's eight to 10 adult bucks per 100 does. My advice would be to hunt! "Hunt in units where you don't need a lot of points to draw a tag, that way you can learn the unit and learn the deer so you can come back and have a more productive hunt each time." Holland also noted the majority of public land is found west of I-25. The eastern side of the state is mainly private land, meaning you'll probably have to hire an outfitter. Special Details: Mule deer occupy the western side of the state mainly in units 1, 2, 3, 17, 18 (north to south). Nonresidents can only draw muzzleloader or archery permits for mule deer, and there's a major catch: You must apply for a whitetail permit in order to apply for a muley permit (aka the $100 mule deer stamp), and your chance of drawing a whitetail permit in those five units is typically 70 percent or greater. The odds of drawing the mule deer permit ranges from 12-60 percent depending on the unit. The exciting part about mule deer hunting in Kansas is that it's relatively new and untapped for nonresidents. Prior to 1999, nonresidents weren't allowed to hunt in the state. However, as noted above, if you want to hunt mule deer in Kansas, you'd better cross your fingers and plan to hunt whitetails. But for the die-hard deer hunter, that might not be a bad strategy. "I think western Kansas offers some of the best whitetail hunting in the entire state, and Kansas is a whitetail-hunting mecca," Pawlak explained. "I drew the archery mule deer stamp a few years back. I spotted a big mule deer, but then I glassed up a humongous whitetail and I spent the rest of my week spotting and stalking that whitetail. It makes for an interesting and exciting hunt." Western Kansas consists mainly of private ground, so hiring an outfitter or knowing the right farmer is your ticket. The state does have a Walk-In Hunting Access program and some state wildlife areas in mule-deer country, but it's fragmented and probably highly pressured. Moretti shared his thoughts: "If you can draw a mule deer tag and get private land access, there are some really nice, big bucks in western Kansas." Special Details: You can utilize up to five choices on the permit application, in order of priority. A good strategy is to try for a rifle tag using your first three choices and then opt for muzzleloader or archery tag for last two choices. "We manage for quality, so most hunters we hear from are willing to wait a year or two to hunt," explained Chris Healy, public information officer for the Nevada Department of Wildlife. "But they expect to get a chance to shoot a high-quality [trophy] deer." Healy mentioned that Elko County attracts the most out-of-state hunters in units six and seven. "That's where we have the most deer," he said. If you're seeking a DIY adventure, Healy offered a promising factoid: 86 percent of Nevada is composed of public land. He specifically recommended deer hunters consider central Nevada near Austin and Eureka (units 16 and 17). "These areas are underrated," said Healy. "It's tough, rugged hunting, but there's great land access and draw odds are good." For trophy hunters, Pawlak shared some helpful hints: "I really like the units in eastern Nevada around the towns of Ely and Pioche. The early hunts are difficult for mule deer hunting no matter where you're at, but late-October and early November seasons are highly sought after. Tags for these hunts typically take 10 years or more to draw, but they're worthwhile hunts with excellent trophy potential if you're willing to wait." Moretti also noted the prowess of eastern Nevada, pointing to solid spring rainfalls in 2015 as an indicator that bucks should be packing on healthy headgear. A general lack of water is a major reason MDF chapters have focused heavily on building guzzlers for deer in the state. Special Details: "Quality" and "high-demand" permits are classified by the state as more premium hunts than you'll get with a standard permit. Reputable trophy hunts can be very difficult for adults to come by in New Mexico, but according to Jordan Christensen, a consultant for Cabela's T.A.G.S., the state is definitely worth considering for youth hunters. "Many units in the state have special hunts for youth under the age of 18 [must have hunter's safety card]," said Jordan. "The draw odds are significantly higher for youth than adults for these hunts." As a mentor, these hunts present an ideal opportunity to enjoy a hunt with a kid and learn more about an area for future hunts. As a former New Mexico taxidermist, Christensen learned a lot about where and when bruiser bucks are killed in the state. He said, without question, the late-January archery rut hunts are the ticket to trophy muleys. "Any given unit in the state could produce an exceptional deer," said Christensen. "But unit 2C continually seems to produce the biggest bucks." If you simply want to go deer hunting without concern of killing a trophy, New Mexico might not be your best option because of generally low deer densities, but Christensen mentioned the following units for high draw odds and decent hunting: 17, 30, 31, 34 and 36. State wildlife managers are proactively managing predator populations and experimenting with deer trap-and-transplant efforts, with the goal of successfully relocating urban deer back to the sticks. The MDF is also active in New Mexico with eight chapters across the state. "The deer herd has been struggling in New Mexico," explained Moretti, blaming drought as the main culprit. "But people are raising their hands to help, so I'm confident we're going to really see a renewed revival of New Mexico mule deer in the next 4-5 years." Special Details: Utah sells a 365-day hunting license, so if you plan it right you can get in 2 years of applications on one hunting license. The state has "general-season" permits, but don't be mistaken by the lingo because these are not over-the-counter permits. General-season permits are distributed based on preference points. Limited-entry permits use a modified bonus point system in which 50 percent of permits go to applicants with maximum points, while the remaining 50 percent of tags are allocated in a random draw. "The state has taken large regions and broken them down into 'micro' units. Each mountain now has its own unit. It's a preference point system now, whereas tags were formerly available over the counter [general]. In the past, hunters could bounce from general unit to general unit during the course of their hunt, but now they can only hunt in the unit for which they have a permit. The state is managing individual deer herds vs. a blanket management strategy, so we're already seeing improvements in the state deer herd." Christensen urged trophy deer hunters to keep an eye on Utah because the average age class is steadily climbing. Premium tags are usually tough to get in Utah, but Christensen hinted toward the increasing buck quality and hunting opportunities in some of the general units. "The Plateau Thousand Lakes unit [25B] is the most difficult general-unit tag to draw," he said. "Yet, it's undersubscribed for archery, and it only takes 3 years to draw a muzzleloader tag or 5 years for a rifle tag. The chance of shooting an above-average buck in these types of units is getting better all the time." According to Moretti, moisture levels were higher than normal in 2014 and 2015 is also seeing record rainfalls. Combine the rain with two consecutive mild winters with high fawn survival and Utah deer are seeing a bright spot, but Moretti balanced his optimism with caution: "Like anywhere in the West, we can turn right around and end up in a drought or get a hard winter, either of which could wipe out the gains we've made." The Mule Deer Foundation (MDF) was founded in 1988 as the first official nonprofit organization dedicated to the conservation of Odocoileus hemionus — black-tailed deer and mule deer. Since then, MDF has gathered the grassroots support of more than 150 chapters with nearly 50,000 members nationwide. MDF continually works to improve habitat, control predators and counteract localized threats to mule deer throughout their range. "The state of the Mule Deer Foundation is really good right now," noted Moretti, "Financially, we had our best year last year in terms of fundraising, but we need to keep pushing for growth." Moretti is right. There's a long road ahead for the conservation of mule deer, and dollars are necessary to pave the way. Even if you don't live in muley country or plan to hunt these amazing deer in your lifetime, you can still positively affect the future of the vulnerable species (and enjoy numerous member benefits) by joining MDF.